I’d been reading the fabulous Meet the Wikos blog post about hotdogs when I remembered I still had 2 of those very same sausages in the freezer somewhere. I was going to make corndogs but I decided that I’d actually prefer Chilli hotdogs instead. I used the chilli from the same book, Vegan Substitutions. It’s a rather strange chilli, reminiscent of spicy beanfeast (for any UK veggies of a certain age; a student staple for me!). It’s quick and easy to make because it doesn’t have many ingredients. I wouldn’t want to eat it as a chilli with rice, but it works well in a dish like this (and I made a fantastic breakfast burrito with the leftovers the following day). 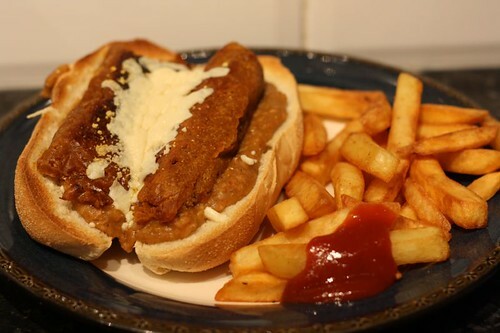 I slathered my chilli on a bun, put the fried sausage on top, added some grated vegan cheese and put the whole lot under the grill. Served with chips and ketchup; it was a fabulous meal. I will be making another batch of those sausages soon! This entry was posted in Vegan Substitutions by efcliz. Bookmark the permalink. That looks good. I’ve never had a chili hot dog, but I can’t see how it could not taste amazing. That book seems to be very popular… might have to get it. A very Texan treat,…well, at least if you’re a Texan vegan. That looks amazing. I want to climb inside my screen and eat it.